Pulitzer Prize–winning journalist Humes (A Man and His Mountain: The Everyman Who Created Kendall-Jackson and Became America’s Greatest Wine Entrepreneur, 2013, etc.) crafts an informative and briskly told “transportation detective story” focused on the way the world moved on Friday, Feb. 13, 2015. His day began when his iPhone chimed like Big Ben. Made from materials from China, Japan, Germany, the Netherlands, Taiwan, Korea, and several states in the United States, the components “collectively travel enough miles to circumnavigate the planet at least eight times before the phone receives its first call or sends its inaugural text.” Humes identifies the shipping container and the container ship as essential to the creation of the consumer goods industry, but he notes that fleets of giant container ships, which “burn fuel not by the gallon but by the ton,” threaten the environment, already overloaded ports, and rail, road, and trucking systems. As he proceeds through his day, Humes traces the manufacture and transport of aluminum cans, such as the one holding his store-brand soda; the medium roast coffee that has come to him from Ethiopia; and the pizza that his son orders from a local Domino’s franchise. Several chapters, not surprisingly, consider Americans’ preference for cars over public transportation; Humes underscores the prevalence of traffic accidents, including “gruesome statistics” for the likelihood of being killed or injured by a drunk driver, “the number one cause of traffic deaths.” An appendix gives “a partial list of fatal crashes” on Feb. 13. 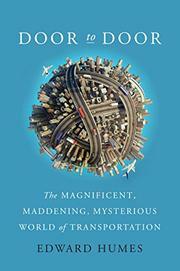 Humes makes a convincing argument that “our brilliant, mad transportation system” is unsustainable. Walking, ride-sharing, and biking are the small choices, he says, that add up to big changes.